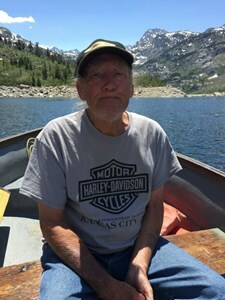 William Raymond Huffman, 76, of Junction City, formerly of California, passed away on March 12, 2019 at his home. Cremation is planned; a Celebration of Life service will be held in California at a later date. He was born on February 28, 1943, Glendale, CA to Minnie Asher Huffman. He married Janet Decker in 1961 and they had one son. William and Janet later divorced. In his early years, he enjoyed drag racing. For many years he worked in the grocery business as a produce manager and clerk. Later he owned a family cleaning business. William is survived by his son, William Richard (Aimee) Huffman of Milford, KS; ex-wife, Janet Huffman of CA; two brothers, David (Karen) Huffman of CA, Gary Huffman of Tujunga, CA; sister, Terry Smith of NC; and grandson, Bryce Huffman of CA. He was preceded in death by his mother Minnie Huffman, and a brother and sister who were twins. Mass-Hinit Funeral Chapel, of Junction City, has been entrusted with arrangements. Add your memories to the guest book of William Huffman. Geezer was the most honest guy I knew. Said whatever was on his mind and I love him for that. I was never very close to my uncle but the memories I do have I will keep forever. I think I get my love for Mexican food and Dr Pepper from Geezer..every time I open up a DP I think of him. It took me a little while to write this because it seems like the part of my life that the Huffmans were in seems so far away. Grandpa Pepper was always a little weary of new people and ill never forget how he opened his heart to me so quickly. Bryce, his grandson, was my best friend when i was still living back in California. I spent alot of time with the family next to so many dirtbike tracks and I will never forget how much fun we had and just being there to support such great people. Those memories will stay with me forever and I hope you are able to watch down on us from heaven. Love you Grandpa Pepper! I remember William as having a humorous spirit. He was always making jokes and laughing when I was around him. For some time I was a part of his family, known to him under the alias "Awesome". I hope that he is resting peacefully and still being his funny self in spirit. My best wishes go out to the entire Huffman family. I met Bill Huffman Jr at the motocross track a couple years ago. As we got to know each other I met his father William. One time the three of us were on the road heading home and we stopped at a McDonalds for a bite. Of course we had a good time recapping the events of the day, but when William wanted an ice cream we made Bill get up and get us all one. William and I had a good time making Bill wait on us, and I think William really enjoyed having Bill get him everything he asked for. Just good spirited fun. One of those days when we didn't have to be anywhere at anytime. I will always remember that day. I'm a friend of Bill Huffman, William's son. Colorado. We camped together and I got to know William a little. He was funny and made me laugh alot on that trip. He was a great guy for sure and will miss him and his personality. Rest easy William. I didn’t know him very well but the time I met him going to Colorado he was a really nice and funny man. He always had a joke or something funny to say. He will be missed. My dad loved racing cars,fishing and riding his Harley, but mostly his family, brothers and sisters. A great story about him I want everyone to know. We went to Mammoth mtn Ca with his grandson and friends. He stayed home and didn’t join in the days adventures. So we thought! Turns out he had his own adventure that day and climbed like Spider-Man from a 3rd story balcony down to a second then to the ground. Not once but twice? Ask me more when we’re at the celebration of life. This summer in California. I have pictures and other witnesses. He will be missed greatly by others,but me most of all. I love you dad.